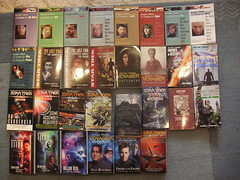 This decision is quite hard since I read many great books starting with the “A time to…” series and also the SCE paperbacks, as series that I really started to love esp. thanks to the completely new set of characters. 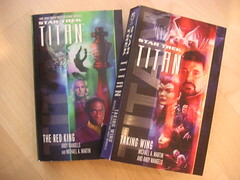 Then Andy Mangels and Michael A. Martin wrote two books about the new command of former Enterprise’s first officer William Riker: The U.S.S. Titan, which really suprised me with its mixed up crew and old and new friends. 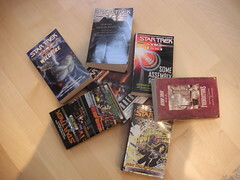 During the summer holidays I needed some books for my trip to Denmark , a time were I read most of the “A time to…” series and also the “Homecoming” miniseries telling the story of what happened when the Voyager finally came home. This award definitely belongs to “Articles of the Federation”, a book that was completely different from all the other Star Trek books I’ve read so far. It tells the story of the newly elected Federation President Nan Bacco and introduces the reader to the politics behind the UFP. Since normally everything is about Starfleet and their mission of exploration and defense it was really refreshing to read about the politics that are normally only background stories at best. 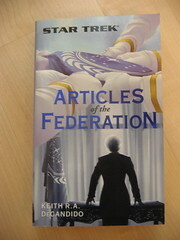 Keith R. DeCandido wrote with “Articles of the Federation” a book, which I can without any problem recommend to any Star Trek fan out there.